We will make every effort to honor your hospital room request. However, rooms are assigned based upon availability and needs of patients. Please understand that you may be requested by the hospital to change rooms during your hospitalization due to other patients’ medical and social needs. The Ministry of Health, Labor and Welfare of Japan has required medical institutions to take strict measures against hospital-acquired infection to prevent the spread of infection within the country for some time (“Measures against Hospital-Acquired Infection at Medical Institutions, etc.,” dated June 2011). Now, in addition to the measures already in place, due to several reported cases of infection with multiple-drug-resistant bacteria of foreign origin, and also pursuant to the ministry’s additional notification*, patients from any regions or countries who have history of inpatient treatment during the past year at overseas medical institutions are required to undergo screening for a multiple-drug-resistant bacterial infection prior to admission to the university of Tokyo Hospital. We sincerely appreciate your understanding and cooperation. Please use cell phones in designated areas ONLY! 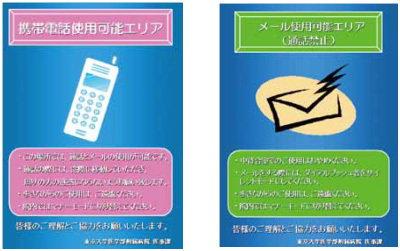 (For information about areas designated for using cell phones, see "Notes on the use of cell phones (announcement)" displayed in the hospital. )However, you may be asked not to use cell phones even in designated areas for using cell phone in the surroundings of patients using an infusion pump, respirator, or other medical devices that may be affected by electromagnetic waves. The hospital staff members use hospital PHS microcellular phones that do not affect medical electronic devices.